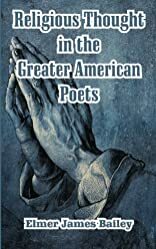 Religious thought in the greater American poets. Religious Thought in the Greater American Poets was written by Elmer James Bailey. Religious Thought in the Greater American Poets was published by Pilgrim Press. About Elmer James Bailey (Author) : Elmer James Bailey is a published author. Published credits of Elmer James Bailey include Religious Thought in the Greater American Poets.